Lois Lane struggles with how to talk to her son about what's happening in Metropolis. She remembers when Clark died and doesn't want to scare Jonathan by telling him that defeating the monster once cost Superman his life. Back in Metropolis Superman continues his battle with Doomsday as Jimmy tries to figure out what's going on with this Clark Kent that suddenly appeared. Lex takes the respite to rebuild his armor with a Mother Box. The fight with Doomsday opens up a hole in the street and Clark manages to fall into it breaking his arm in the process. Lex arrives and Superman convinces Lex he'll help more people by getting the civilians out of the battlefield. Lex has his doubts about this new Clark but Clark is adamant that he is the genuine article. Superman opens up his heat vision to full blast but accidentally sets off a gas line and there is a tremendous explosion. When the smoke clears Doomsday looms over Clark Kent and roars. Story - 5: It took a lot of self-control not to put the Snickers ad in this issue into the synopsis. I loved the ad that much. So we're three chapters into this new era of ACTION COMICS and for the third issue in a row I have a massive smile on my face when I get to the last page. Also for the third issue in a row this has nothing to do with the fact that "my" Superman is back. It's because we are being given a Superman story that has plenty of action and super-heroics mixed with characters that we care about because the writer makes us care about them. Superman can fight Doomsday for fifteen issues and level half the United States but if we don't see the emotional cost of that when it comes to the people that care about him it feels hollow. Opening this issue with Lois thinking about the day her husband died and having to figure out how to keep it together so her son doesn't freak out is powerful. It makes me feel something and it gives the fight more gravitas. There were other aspects of this issue that I enjoyed. The Who Is Clark Kent sub-plot is coming along nicely. Nothing is being confirmed or denied but we're getting little teases here and there (like the conversation Clark and Superman have in the sewers) that keep it fresh in our minds. Lex continues to surprise me. I have no idea where his story is leading but the more I see him in this book the more I am pulling for him to become the hero he claims he wants to be. This is significant because for the past few years I have bristled at the idea of villains becoming heroes because I think it takes away from what makes those characters unique. I like the fact that I am starting to root for Lex because if he succeeds it's great and if he fails I'll be a little heartbroken. Either way I am engaged as a reader. I honestly can't wait to see where all of this is going. Ending it on such a great cliffhanger is such a tease but at the same time I am loving it. I continue to be thankful that this book is bi-weekly because this book is too good to wait thirty days between chapters. Art - 5: There was a lot of great art in this issue. Tyler Kirkham has a great handle on action, so all of the Superman v Doomsday pages are just amazing. The opening pages were my favorite. That two-page spread of the flashback Lois' hair flowing across the pages with the three DOOMSDAY images took my breath away and I don't write that sort of thing often. Kirkham also has a great handle on Lex's armor. 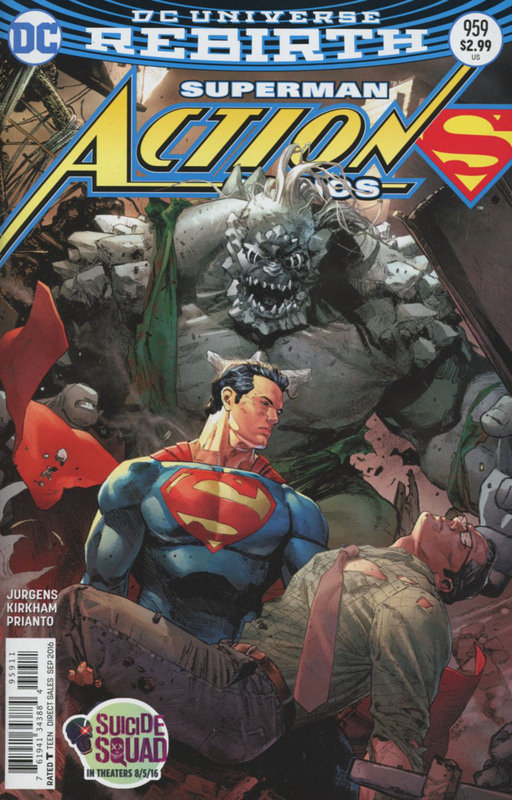 That final page was the perfect cliffhanger with Doomsday looming over the injured Clark Kent. The art is really complimenting the writing and so far this run of ACTION COMICS has not disappointed on any level. 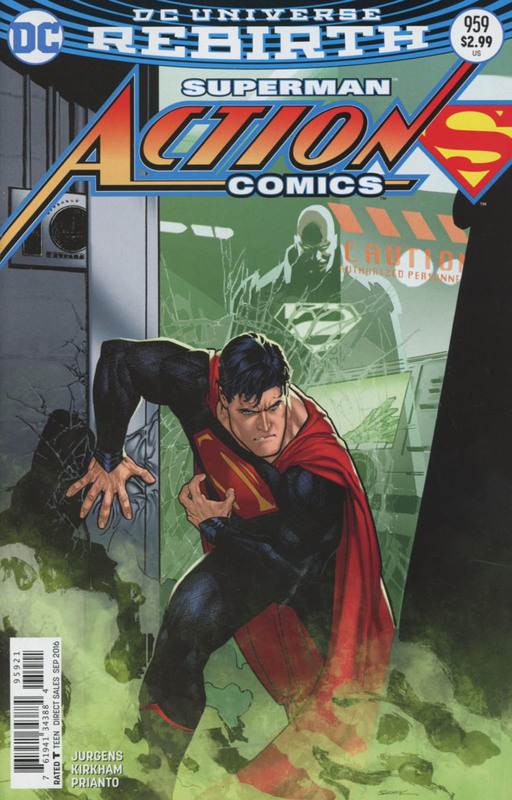 Cover Art - 5: Superman looks fantastic on this cover. I like the composition quite a bit too. Doomsday is looming over Superman who is holding the unconscious form of...Clark Kent? If you weren't reading this book already this cover would definitely pique your interest. Variant Cover Art - 5: This is a really creepy cover. Normally this would turn me off but the past few months have built up so much good will in me that I can't bring myself to dislike it. It's a variant cover. It's supposed to be different. It serves its purpose.